Preheat the oven to 350°. Toast the walnuts for 8 to 10 minutes, or until golden. Let cool, then coarsely chop the nuts. In a large bowl, whisk the vinegar with the shallot, mustard and a generous pinch each of salt and pepper; let stand for 10 minutes. Whisk in the olive oil and 1/4 cup of the blue cheese. 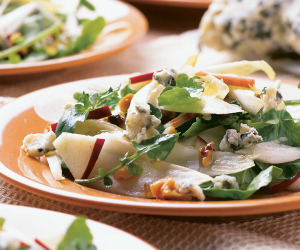 Just before serving, add the celery root and apples to the dressing, season with salt and pepper and toss well. Add the chopped nuts and the remaining 3/4 cup of blue cheese and serve. The shallot dressing can be refrigerated overnight.